3Seniour lecturer in Andhra polytechnic college, Kakinada,533003,A.P. 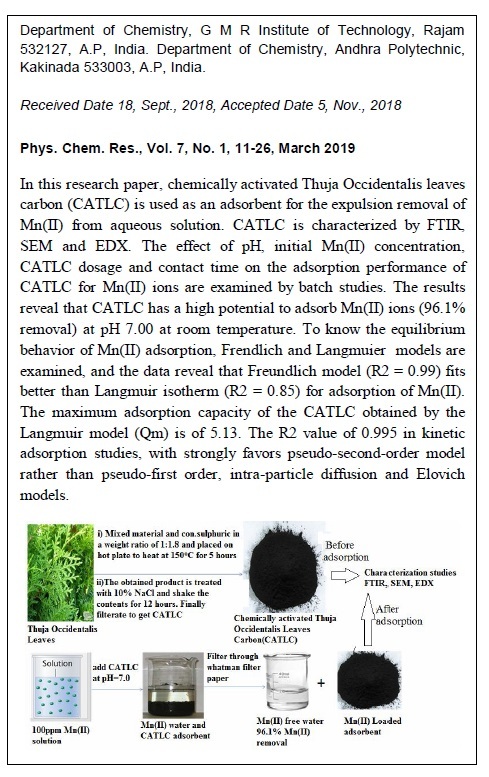 In this research paper, chemically activated Thuja Occidentalis leaves carbon (CATLC) is used as an adsorbent for the expulsion of Mn(II) from aqueous solution. CATLC is characterized by FTIR, SEM and EDX. The effect of pH, initial Mn(II) concentration, CATLC dosage and contact time on the adsorption performance of CATLC for Mn(II) ions are examined by batch studies. The results reveal that CATLC has a high potential to adsorb Mn(II) ions (96.1% removal) at pH 7.00 at room temperature. 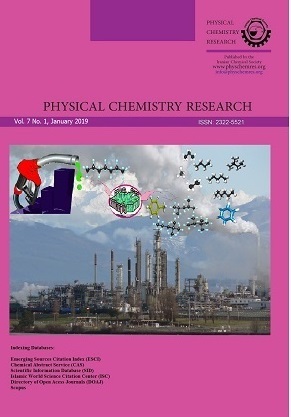 To know the equilibrium behaviour of Mn(II) adsorption, Frendlich and Langmuier models are examined, and the data reveal that Freundlich model (R2= 0.9900) fits better than Langmuir isotherm (R2=0.8499) for adsorption of Mn(II). The maximum adsorption capacity of the CATLC obtained by Langmuir model (Qm) is of 5.13. The R2 value of 0.995 in kinetic adsorption studies, with strongly favours pseudo-second-order model rather than pseudo-first order, intraparticle diffusion and Elovich models. Regeneration studies indicate that CATLC can be regenerated easily and reused for several adsorption-desorption cycles, with brine solution as a regenerating agent. Hence, CATLC adsorbent is the best alternative for Mn(II) rich water samples.